RDF FFT representation, received with two ICS101 induction coils. PC1 pulsation evidenced in white oval. 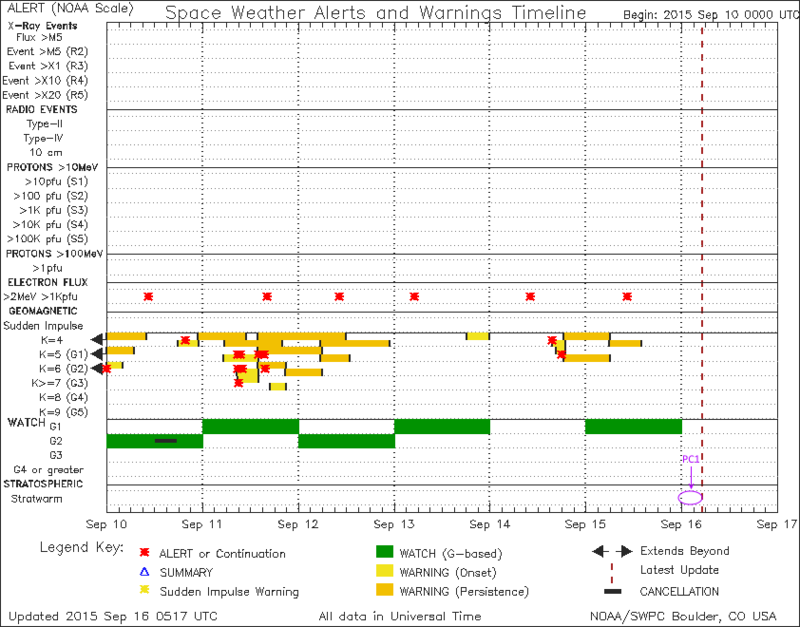 Schumann resonances marked on left part, some carriers coming from main distribution lines, train passing 5 km away starting from 03:30 UTC (05:30 local time). Received with ULFO induction coil. PC1 pulsation evidenced in white oval. 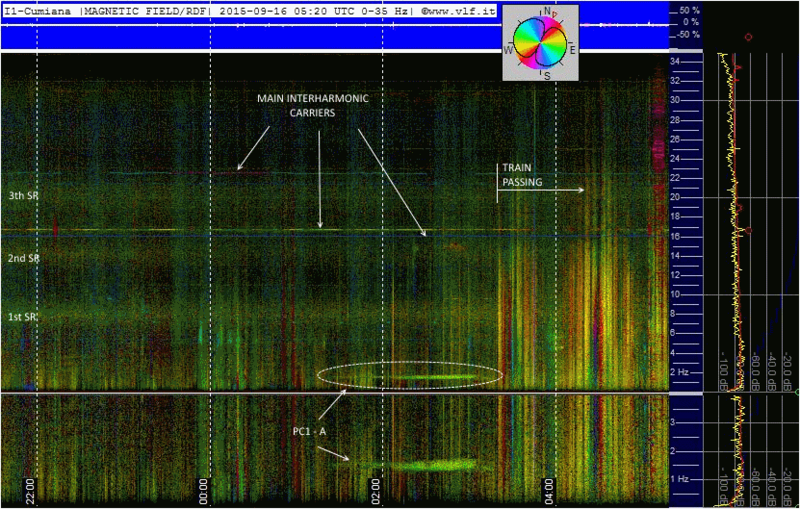 Schumann resonances marked on left part, some carriers coming from main distribution lines and microphonic effect caused by coil shaken by wind. Received with ICS101 induction coil. PC1 pulsation evidenced in white oval. 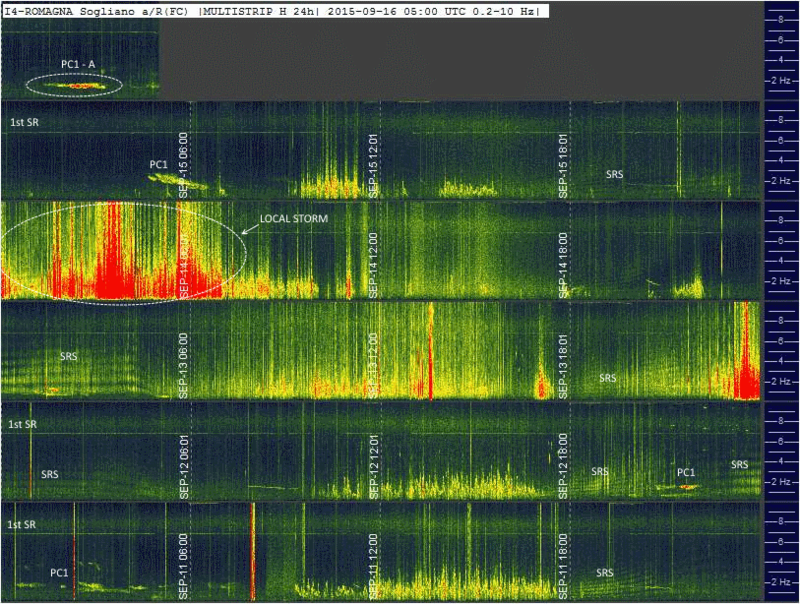 Schumann resonances marked on left part, some carriers coming from main distribution lines and microphonic effect caused by coil shaken by wind. Received with induction coil. PC1 pulsation evidenced in white oval. 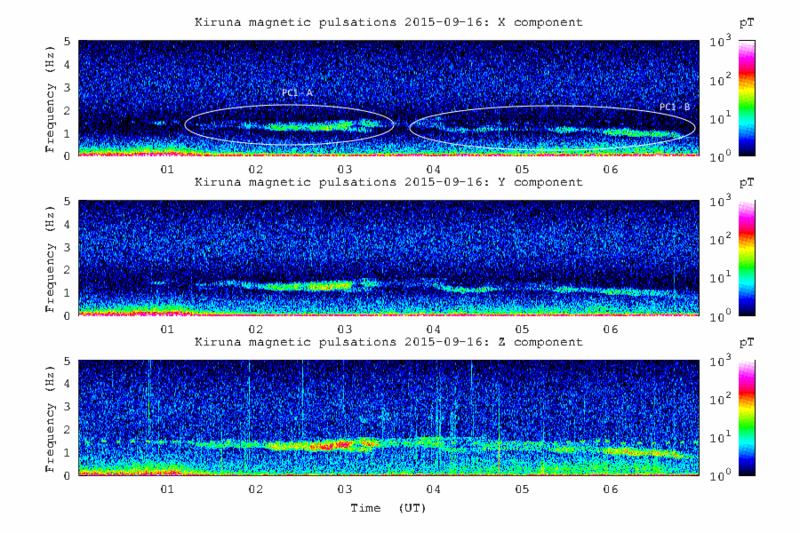 Schumann resonances marked on left part, some carriers coming from main distribution lines. Received with ICS101 induction coil, daily multistrips. 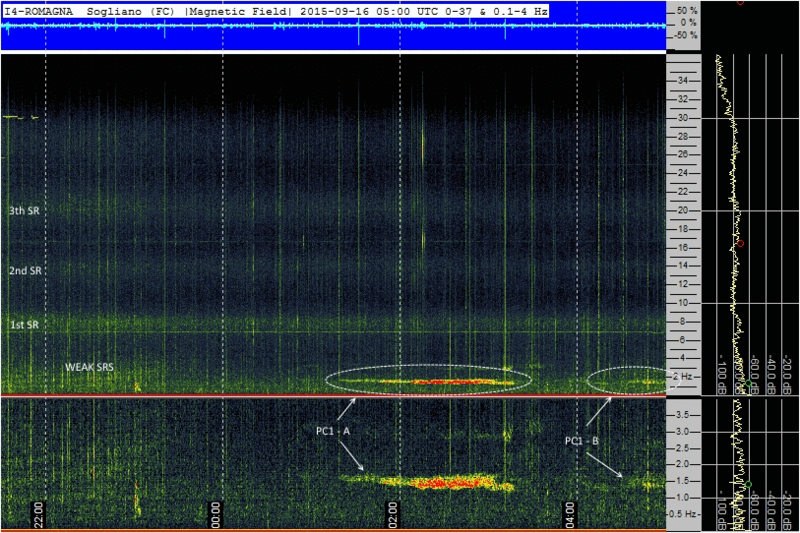 PC1 pulsation evidenced in white oval on top. 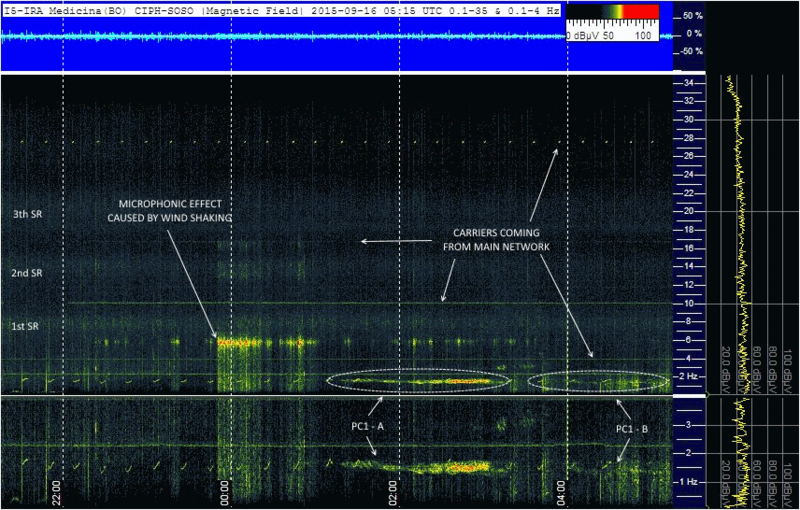 First Schumann resonance marked on left part, many PC1 and SRS. Map taken from Google Map. Analyzed with Sonic visualizer, detail below 4 Hz. 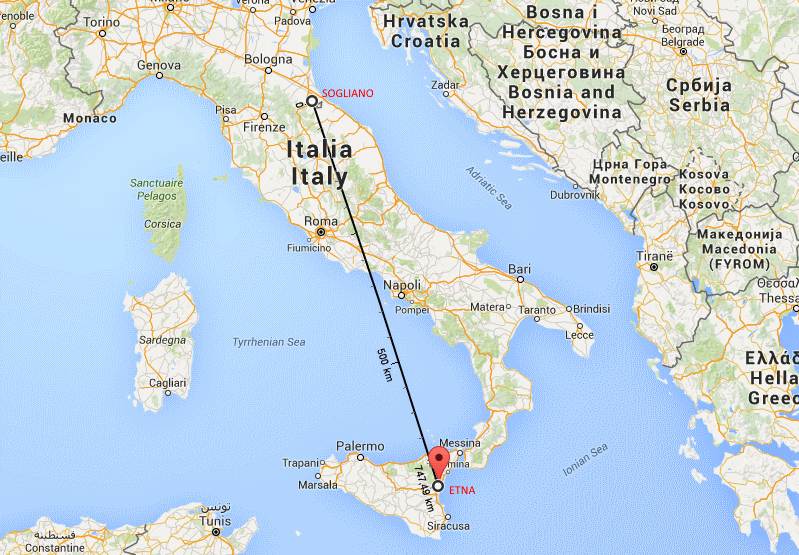 Receptions between Sogliano and Etna (750 km away) are compared. Analysis with Sonic visualizer, from 0 to 60 Hz. As before receptions between Sogliano and Etna are compared. 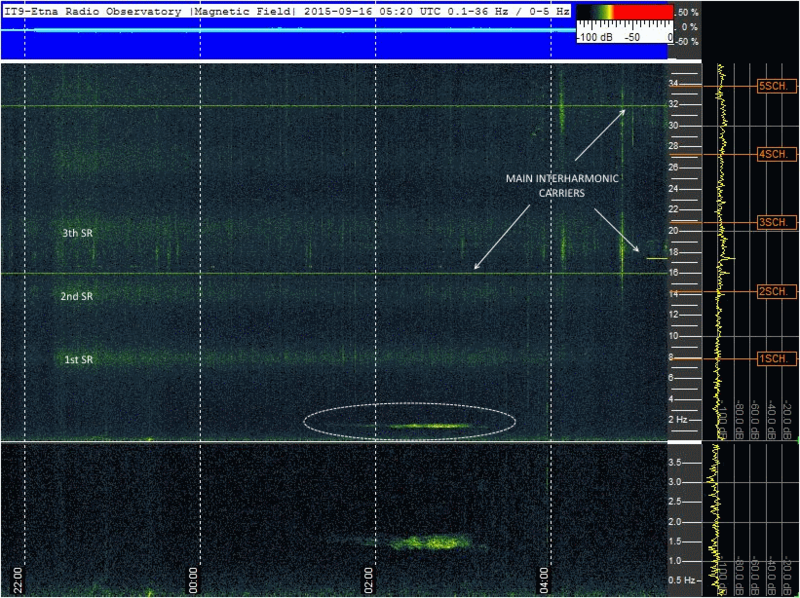 Sogliano uses a low pass filter over 35 Hz allowing an high dynamic range , Etna station is not filtered including 50 Hz, so the amplitude graph seems compressed to 0 dB by main carrier .